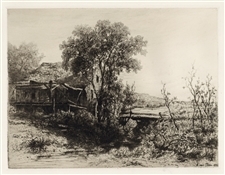 Kruseman Van Elten original etching "Along The Houstantonic"
Medium: original etching. A lovely composition by Hendrik Dirk Kruseman Van Elten. This impression on laid paper was printed in 1880 for The American Art Review. The plate measures 5 1/2 x 9 inches; the sheet size is 9 x 12 inches. Signed in the plate (not by hand).